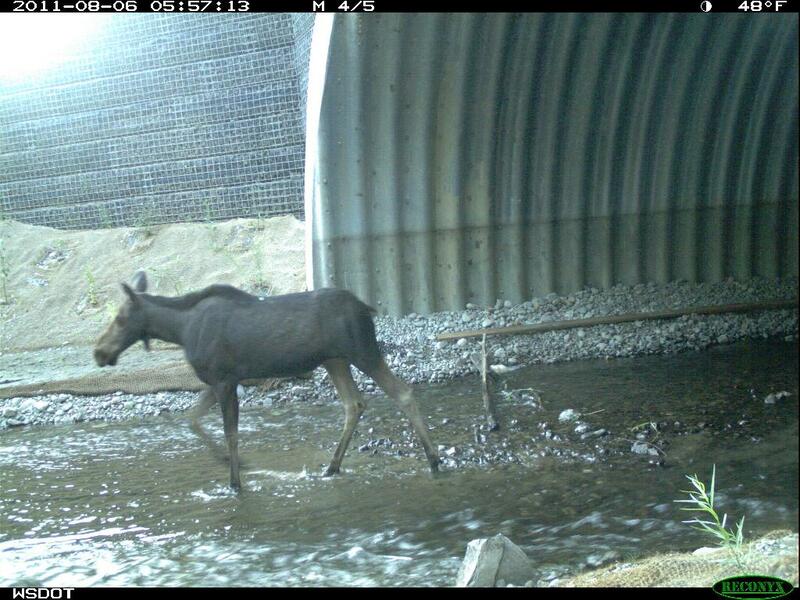 In our work to deliver high quality scientific tools and products to inform decisions that can impact habitat connectivity in Washington and neighboring habitats, we are interested in how organizations and individuals are applying and referencing this science. It is in this application that our products gain additional meaning, and where we can continue to learn. 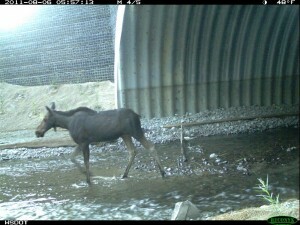 Moose using new underpass created by WSDOT in NE Washington by Spokane. 1) Washington Department of Fish and Wildlife provided least-cost corridors and Habitat Concentration Areas (HCA) layers to Bureau of Land Management to inform their Washington land management plan revision. 2) Habitat networks from the statewide analysis are being used to inform transportation corridor plans and mitigation strategies for highway improvement projects. To aid decisions on where to invest in highway improvements to benefit wildlife and improve safety (including the Environmental Retrofit or “I4” program), the statewide and Columbia Plateau habitat networks will be used, along with other information, to rank segments of the state highway network as high, medium or low priority for investing in habitat connectivity infrastructure. 3) Model validation analysis for Greater Sage-Grouse provided genetic analysis of Greater Sage-Grouse in the Moses Coulee population that indicates this population is genetically distinct from the population on the Yakima Training Center (YTC) as there is little genetic exchange between the two populations. This finding emphasizes the importance of augmentation efforts for the YTC population informing work to maintain and recover this species. 4) Western Electric Coordinating Council requested statewide and Columbia Plateau connectivity layers for focal species habitat concentration areas and linkages, landscape integrity core areas and linkages, and climate gradient core areas and linkages for transmission planning. We routinely update a more complete list for our reference as well. Please feel free to contact us with any questions, or to inform us of additional references and uses in the application of our work. In 2013 we hosted a webinar series where users of our connectivity products presented on how they are using the science in their work from transportation planning to land use planning. We welcome feedback from potential or current users of our products on how we can more effectively communicate and provide information to you to ease your use of our work.